NYC, 02/16/2019, 11:00AM. 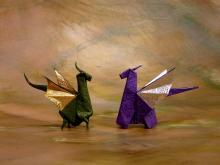 Origami Meetup Group. Origami, from ori meaning "folding", and kami meaning "paper" is the art of paper folding, which is often associated with Japanese culture. In modern usage, the word "origami" is used as an inclusive term for all folding practices, regardless of their culture of origin. The goal is to transform a flat square sheet of paper into a finished sculpture through folding and sculpting techniques.